Looking for an exceptional game? 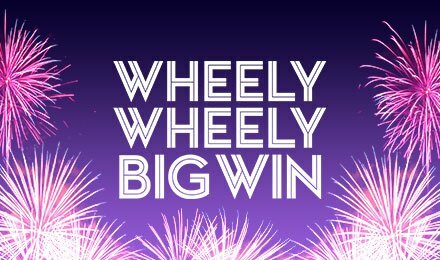 Try Wheely Wheely Big Win at Moon Games! It is an innovative game by Gaming Realms coming with a simple layout. It is an exciting mix of slots and casino games! In the centre of the game screen, you can see 2 wheels. Your aim is to trigger the potential win displayed in the centre of both wheels. With a purple backdrop, it is a clean and minimalistic game which is set to become one of your favourites! Enjoy this game on a PC, mobile or tablet at Moon Games! Start enjoying Wheely Wheely Big Win by clicking on the Stake button at the bottom of the screen to choose your stake. Adjust the 2 wheels using the left and right arrows to decide how much of each wheel you want to put in play. Since some parts of the wheel are aligned with the arrows at the top, the more of the wheels you expose, the higher your winning potential is. The same applies when your wheel segment is less and your winning amount is higher. Once the wheels are adjusted, hit the Spin button to start. Your goal is to make the wheel land between the arrows at the top of the screen. Earn a great win if it lands on the chosen sections of both wheels on the arrow. Earn a higher amount when you choose to keep your wheel segments small. Bet Levels: Bet levels are not present. Amount of Paylines Selection: Bet levels are not present. Coin Values: The stake values vary from 50p to £100. Do you want to speed things up on Wheely Wheely Big Win? Press the Turbo button to launch several rounds played in rapid succession. If you end up with a losing wheel, you can spin it again by clicking on the Repeat Bet button which spins the wheel using the same bet as the original spin. If you wish to spin a losing wheel at a stake indicated on the re-spin button, use the Re-spin option. Want to start afresh? Click on New Game to start a fresh round. Try this exceptional game anytime at Moon Games, the top online casino. Wish you good luck!